No matter how much this idea makes you squirm, it’s a fact. No matter who you are, how young or old, what measure of success you’ve attained, or where you live, mortality remains the great equalizer. With each tick of the clock, a moment of your life is behind you. Even as you read this paragraph, seconds passed that you can never regain. Your days are numbered and each one that passes is gone forever. If you’re like me, you may be tempted to view this reality as harsh and unwelcome, to let it overwhelm and even paralyze you. But that’s not our purpose in writing this study series – just the opposite. Rather than inhibiting us to play it safe, I’m convinced that embracing our time on earth as a limited resource has incredible power to liberate us. 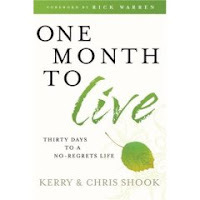 For most of us, if we knew we only had one month to live, we would live our lives differently. We would be more authentic about who we are and more deliberate about how we spend the time we have. But such a contrast begs the question: What keeps us from living this way now? I invite you to take the One Month to Live Challenge!